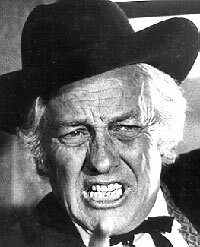 Strother Martin was a latter-day character player in the best Hollywood tradition, at a time when that breed was disappearing from the screen. The consummate character actor shared the screen with some of Hollywood’s biggest stars—John Wayne, Robert Redford, Paul Newman, James Stewart, Alan Ladd, Audie Murphy, Glenn Ford and many others. At an unimposing 5' 8" he once described himself as having a walk “like a bad imitation of Bob Hope” and a voice like “Shirley Temple with a cold.” Yet he somehow had a gift of endowing his whiners, frauds, losers, undesirables and crazy rurals with an endearing, likable quality. Born March 26, 1919, in Kokomo, IN, Martin became a champion diver at the University of Michigan while he worked toward a theatre arts degree. After Navy service in WWII, he moved to Hollywood in 1948 with his first acting job as a leprechaun on a KTLA-TV children’s show. His first film was a bit in “The Asphalt Jungle” (‘50) after which he began to work steadily in films and on TV, however his first western, “Drum Beat”, wasn’t until 1954 and it really wasn’t until ‘56 that Martin began to appear primarily in westerns. Among others, he can be seen in “The Black Whip” (‘56), “Black Patch” (‘57), “Cowboy” (‘58), “Wild and the Innocent” (‘59), “Horse Soldiers” (‘59), “Man Who Shot Liberty Valance” (‘62), “McLintock” (‘63), “Sons of Katie Elder” (‘65), as well as dozens of TV episodes—“Zane Grey Theatre”, “Broken Arrow”, “Trackdown”, “Jefferson Drum”, “Texan”, “Rebel”, “Have Gun Will Travel”, “Rawhide”, “Legend of Jesse James”, “Big Valley”, “Dakotas” and many others. 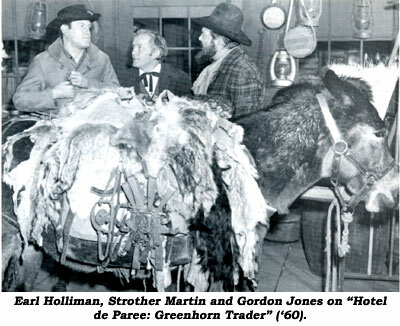 In ‘59-‘60 he was a regular as Aaron Donager, a townsman friend of Sundance (Earl Holliman) on “Hotel de Paree”. 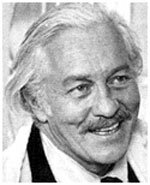 “Cool Hand Luke” in ‘67 and his famous line, “What we’ve got here is…failure to communicate,” put Strother into the upper echelon of character actors. He became a favorite of Paul Newman and director Sam Peckinpah—who terrified him according to those who worked with Martin. 1969 was Martin’s banner year. He was seen in “True Grit", "The Wild Bunch” and “Butch Cassidy and the Sundance Kid”, three classic westerns. Off screen, Martin enjoyed gardening, collecting antiques and classical music. After completing a role as The Weasel in “Hotwire” (‘80), one of the screen’s most lovable character players died of a heart attack on August 1, 1980, in Thousand Oaks, CA. He was survived by his wife, Helen.